Color: This changes the color of the atmosphere. In the real world, a haze is almost transparent white, while atmosphere tends to be white or light gray, so the default setting is white. Smog and other types of atmospheric junk can cause other colors to appear, such as oranges and reds. Note: If you change the color of the atmospheric environment, you’ll probably want to change the background color of your composition to match. Otherwise you’ll have layers with one color of atmosphere applied to them against a backdrop of a different color of the atmospheric effect. Start Depth: This sets the distance (in pixels) from the camera where the atmosphere begins. Pixels closer than this distance remain unchanged. Pixels at or beyond this distance have some amount of fog applied to them. How much depends on the other settings you choose. End Depth: If you set the Rolloff parameter to Linear, then the End Depth is the distance from the camera where the fog becomes opaque. Anything at or beyond this point is completely covered by the fog and cannot be seen. Pixels between the Start Depth and End Depth have proportionally more fog as their distance from the camera approaches the End Depth. If you set the Rolloff parameter to either Exponential or Exponential Squared, then any pixels beyond this distance from the camera have the same amount of fog as pixels at this distance. Rolloff: There are 3 different types of fog you can apply. Linear: The amount of fog that covers a pixel is directly proportional to the distance of that pixel from the camera. Exponential: The amount of fog that covers a pixel varies not only with the distance of the pixel from the camera, but also with the value of the Density parameter. Exponential Squared: This works in the same manner as the Exponential version, but increases more slowly at near distances and more quickly at farther distances. Density: This parameter is only valid if the Rolloff parameter is set to Exponential or Exponential Squared. It determines the rate at which the fog increases as the distance from the camera increases. Larger values will increase the fog’s opacity more quickly as you move away from the camera. Input Gamma: This parameter is only available on the individual layers’ effect and won’t display on the Master Atmosphere Control Layer’s list of parameters. This should be set to the gamma of your video footage. If you’re using video in a broadcast format, such as DV, MPEG, MJPEG etc. it should be set to 2.2. If your footage is compressed with Apple’s “Animation” coded for Quicktime, it should be set to 1.8 (even on Windows). 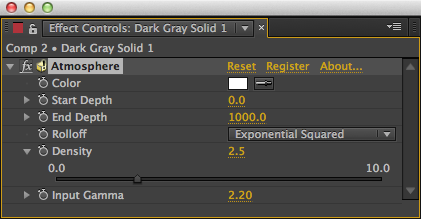 If your footage is from a 3D application that doesn’t apply gamma correction, it should be set to 1.0. If you’re unsure of the value, 2.2 is a safe setting to use. Setting this value correctly will make the fog look more realistic.